Presentation on Saturday 16th, 10:00-11:00, in Kiasma ground floor seminar room. Wikipedia contains approximately 1.3 million articles, over 490,000 of which are in its English language edition, over 200,000 in the German language and over 100,000 in the Japanese language. It began as a complement to the expert-written Nupedia on 15 January 2001. Its name is a combination of Wiki, a Hawaiian word meaning “quick” adopted to describe a kind of collaborative software, and encyclopedia. Having steadily gained in popularity, it has spawned numerous conceptually related sister projects such as Wiktionary, Wikibooks and WikiNews. Wikipedia has been praised for being free, being openly accessible, covering a wide range of topics, and being detailed. It has been criticized for lack of authority versus a traditional encyclopedia, systemic bias, and for deficiencies in traditional encyclopedic topics. Vandalism is a persistent problem. Its articles have been cited by the mass media and academia, and mirrored or forked by websites. Wikipedia’s content has not been distributed officially or on a large scale in any physical form. The idea of a free, open community, united by technology, where increasingly vast amounts of content are actively written, reviewed, and debated for public consumption, makes the Wikipedia distinctive not only amongst encyclopedias but amongst informational resources in general. The credibility of Wikipedia has often come into question, because the fact that the content can be freely edited by anyone who so chooses opens the door for a certain degree of inaccuracy and poorly researched content. Wikipedia is one of the most popular reference sites on the Web, receiving around 50 million hits per day. 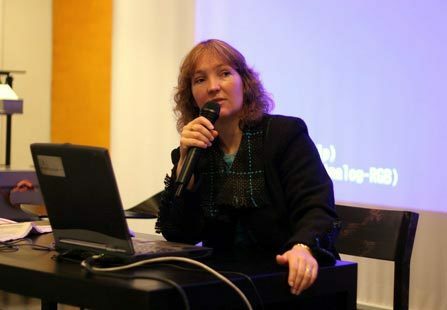 Florence Nibart-Devouard is an editor of WikiPedia, and currently serves as the Vice-Chair of the WikimediaFoundation. Florence was born in Versailles (France). She grew up in Grenoble, and has been living since then in several French cities, as well as Antwerpen in Belgium and Tempe in Arizona (USA). She is a engineer in Agronomy (www.ensaia.inpl-nancy.fr) and also holds a DEA in Genetics and biotechnologies (www.inpl-nancy.fr). She has first been working in public research, in flower plant genetic improvement, and later in microbiology to study the feasability of polluted soil bioremediation. She is currently employed in a french firm, Quantix Agro (www.quantix.com) to conceive decision-making tools in sustainable agriculture. She joined the Wikipedia adventure in February 2002 and is known as a contributor under the pseudonym Anthere. Florence is 36, and live in Clermont Ferrand (France) with her husband Bertrand and her two children, Anne-Gaëlle aged six and William eight. Digitalopenandfree.org is a collaborative paper exploring the means and modes of digital open and free systems. Code or content are not the only things that can be free or open. What do you think about open search, open store, open communication, or open network? What if Amazon, Google, Ebay, iTunes, would be non-profit, and open systems, like Wikipedia or Linux. Healthy markets need competition. Amazon and Ebay are good examples of the mechanism which produces digital monopolies. Lets consider a system, like digital market place, which clearly benefits network effect. Network effect here means, that the quality of the system in increased when the network related to the system grows. Once the system achieves critical mass then there is a clear danger that network effect boosts the system until it is a dominant monopoly. This has happened basically already with Ebay, and Google. Monopolies damage markets. One company, especially one, which is listed in stock exchange, has only a function of being a moneymaker. Shareholders in public markets are mostly faceless institutional instances, and look only highest return for capital investments. Monopoly has dominant competitive advantages. Basically it is very hard for competitors to enter the market, because the monopolistic system has become defacto standard. Today when people make a search, they say that they “googled it”. Company in such position is not interested in developing the system in a way that individual users, or economy would like to. They try to just maximize directly or indirectly profit, and that is why they prefer to make more protective and expanding maneuvers (like Microsoft expanding to Internet, and Games), instead of concentrating developing their core system. Digital open and free systems can compete with existing monopolies, because they are fundamentally different. They can concentrate on providing maximum functionality for end users, despite monetary looses. They are not made for money making. And by replacing these company monopolies, with digital open and free systems we actually improve markets. Value network will be better balanced because there is no dominant player, which protects own business and tries to increase its value profile all the time. Besides economic benefits open and free systems have also individual benefits. Our life is more dependent on digital systems, especially in communication, and information exchange, but also in leisure activities. Open and free systems are the air and water of digital domain. Things needed for sustainable and diverse living. Virtual worlds will be much more interesting places if there is a high amount of baseline technology and systemic resources, which are free and open. Think about the possibilities that open information, open search interfaces, open transaction systems and open communication can provide for emerging virtual worlds, as well as for existing communities. Building a digital open and free system is not easy. Linux is the flagship example of how it can be done, but it is not by far a perfect case example. Both the support, as well as the technology of Linux has its flaws. Organizing an open and free systems development may fail for several reasons. The lesson learned with Open office was that too big project couldn’t be managed only with good spirit and good intention. Office system is so complex, that the project management would have required more resource in order to succeed better. And there are thousands and thousands promising case examples of other open source projects, which had the same or some other problem. Community development processes, and development process in general are not easy to manage, but we are learning about them all the time more, and hopefully in future there are more tools and practices for managing open and free system development process. Besides the organizational problems related to open and free development, there is also an other potentially even more severe problem, and this is quality. Many times, like in Wikipedia, the open and free system is very efficient in producing vast quantities of material, but there can be problems in achieving high quality. In future we have to concentrate on finding practices and processes which improve the quality of open and free systems. One solution to the quality problem may be money. It may sound contradicting to speak about money and open and free system at the same time, but having money for running the organization and maintaining the system almost always helps. If the organization remains non-profit and democratic, then there are usually no problems related to the moneymaking. Digitalopenandfree.org is a collaborative paper exploring digital open and free systems. What are they? How they can be built? As well as what are the concrete cases in question? Idea is to raise discussion, and stimulate new endeavors in this frontier. I am looking forward in hearing your comments, opinions and ideas, on how we could make the digital domain better place to live. 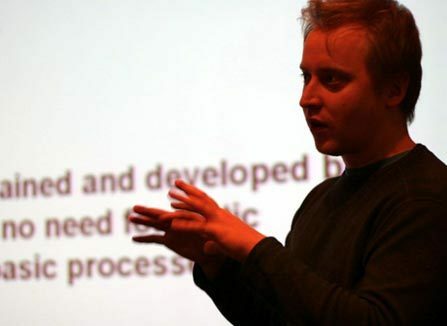 Kai is currently working in Helsinki Institute for Information Technology, in digital content and communities research group. Kai has studied industrial engineering and management, motion picture production, theorethical physics and economics. Kai has been and likes to be involved in both profit and non-profit ventures.